VILLAGE OF TALL TREES- LOCATION! LOCATION! In the heart of everything you need this is a MUCH SOUGHT-AFTER AREA. 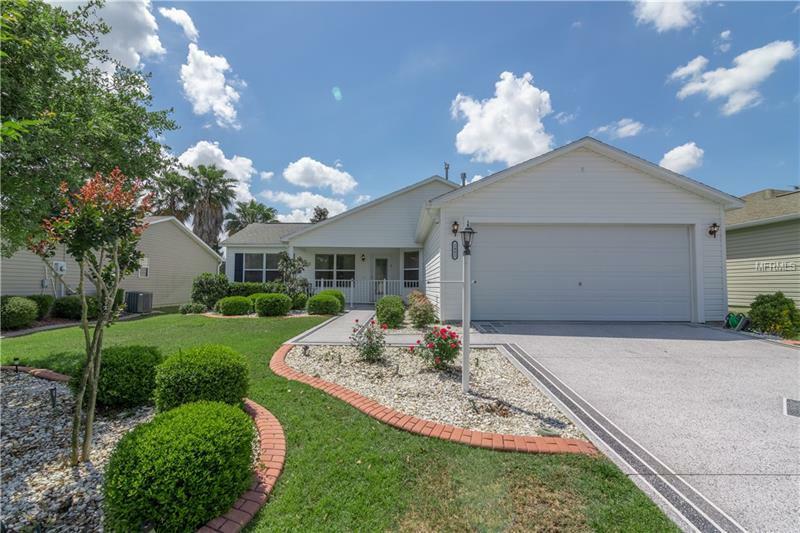 ADORABLE and IMMACULATE 2/2 Galveston/Durango with OPEN KITCHEN. Beautiful (2017) Stainless Steel Kitchen Appliances Pearlesque Backsplash GAS UTILITY Rich MAHAGONY LAMINATE New 2" Blinds throughout; Fresh and Cheerful Tropical Interior Paint Tones PRIVATE REAR with Wall. Enjoy your backyard from your EXPANDED BIRDCAGE. SPLIT FLOOR PLAN offers space and privacy. Painted Drive and Garage Flooring (2-CAR GARAGE) Whole Home Water Softenerâeven Reverse Osmosis for Kitchen Sink. HVAC is (2016). Tall Trees pool is right around the corner as well the Pimlico Village Recreation Center with Family Swimming Pool and (3) fine Executive Golf Courses. Laurel Manor Regional Rec Center close by too and includes a Sports Pool. Southern Trace is a quick trip under the tunnel and across the street! Sumter Landing only about (15) minutes by Golf Cart. Home even has a TRANSFERRABLE TERMITE PROTECTIVE BOND. Some Furnishings Available Separately; Golf Cart is For Sale Separately- $7900. This is a HONEY OF A HOME! Let it BEE yours! Put this on your short list today.